A friend of mine had forwarded me a marketing email he received from a company that I have decided not to disclose. The email was full of wit and humor along with a reference to one of those internet memes I hear so much about. The problem is the email wasn’t funny, didn’t seem witty at, and they totally botched the meme! Watch the video below as we review a great example of a bad marketing email. 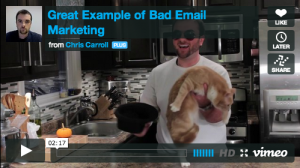 Great Example of Bad Email Marketing from Chris Carroll on Vimeo. Yes this is a real email, and yes this is a real company. Feel free to read the email yourself! Do you find yourself silently mouthing, “I ain’t got time for dat!” to your boss whenever he/she asks for you to pull another “friggin’ rabbit” out of your tiny hat? Are you a marketing professional or a magician? Or are the two synonymous according to your boss? Make it up to us and click here to learn Five Steps to Higher Revenue. Ready to speak with someone now? No problem! Click here to get a REMOVED COMPANY expert on the phone.